Happy New Year dear readers! It’s January, the kids are back in school, the house is quiet, and it’s time to buckle down and get back into a work routine . After two weeks of holiday parties, entertaining and basically over indulging, I should be considering some type of physical activity but quite honestly, this weather makes me want to hibernate! Basically, I’d like to hide out under a cozy blanket until spring and eat comforting foods. However, comfort food doesn’t necessarily have to be unhealthy, does it? Think beef and barley stew loaded with vegetables, hearty lentil and rice soup, shepherd’s pie with extra veggies snuck in, and then of course there’s meatloaf! Who doesn’t love a good meatloaf? 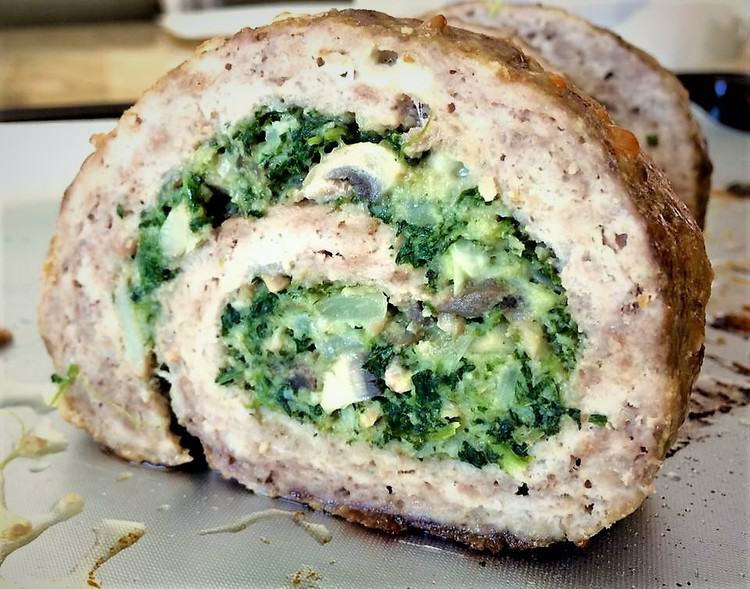 So after considerable thought I decided as my first post of the new year I would share with you my favourite meatloaf recipe: Spinach and Mushroom Filled Pinwheel Meatloaf. Aside from being the perfect comfort food for our current weather, I think it would be the ideal family dinner to boost the morale of your back-to-school kids this week! I have also received several requests for this recipe by my followers, and so here it is at last. This has been my go-to meatloaf recipe for several years. It is not a traditional Italian meatloaf but I’ve given it an Italian touch with my choice of cheeses. I like to use shredded mozzarella or friulano for the meat mixture and a touch of parmesan in the filling. 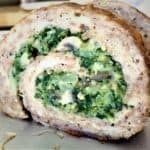 This elegant looking meatloaf is fancy enough to serve for company (as I have often done) because if you roll it just right you get that beautiful swirl of spinach and mushroom filling when you slice into it. And yet, it is a breeze to make. However, I must give you a word of advice, this recipe must be assembled right before baking. I noticed that if you prepare it hours prior to baking, the layer of meat touching the spinach mixture remains red and has an undesirable texture. I recommend you prepare the spinach and mushroom mixture ahead of time, which is ideal as it needs to cool, and put it all together right before you’re ready to bake it. 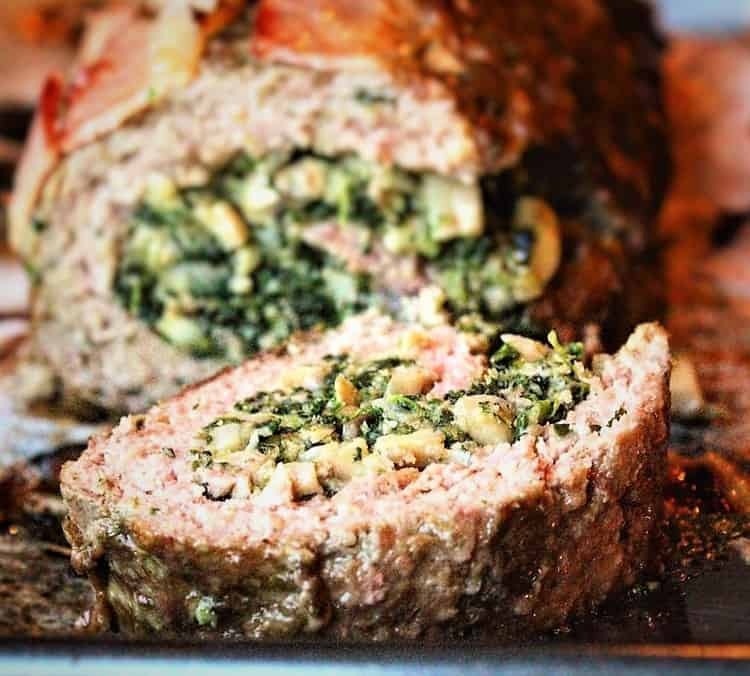 This Spinach and Mushroom filled Pinwheel Rolled Meatloaf is the ultimate comfort food dinner. Perfect for a weekday night family dinner and yet elegant enough for a dinner party! In a large bowl combine the ground meat, cheese, bread crumbs, egg, Worcestershire sauce, salt and pepper. Mix well. Spread meat mixture onto a baking sheet covered with parchment paper. Cover with another piece of parchment paper and flatten, using a rolling pin, into a rectangle. Remove top parchment paper and spread the spinach mixture evenly over meat leaving a ½ inch border. Roll up meat from long end in jellyroll style, lifting with the paper as you roll. Place the meatloaf on a sheet of parchment paper on the baking sheet. Bake at 350F for about 1 hour or until a meat thermometer registers 170F. Serve hot. It looks absolutely outstanding Nadia and so drool worthy! I really hope to try it soon! I’ve actually watched the episode among others and your a natural! Thanks Marisa, I’ve been meaning to post it for a while. As for the show, it has been an exciting experience, thanks for watching!